Stuart, Fla.-based Enrolled Agent (EA) and Certified Tax Resolution Specialist, Jeffrey Schneider of SFS Tax Problem Solutions was chosen by the American Society of Tax Problem Solvers (ASTPS) as the 2018 Top Practitioner. 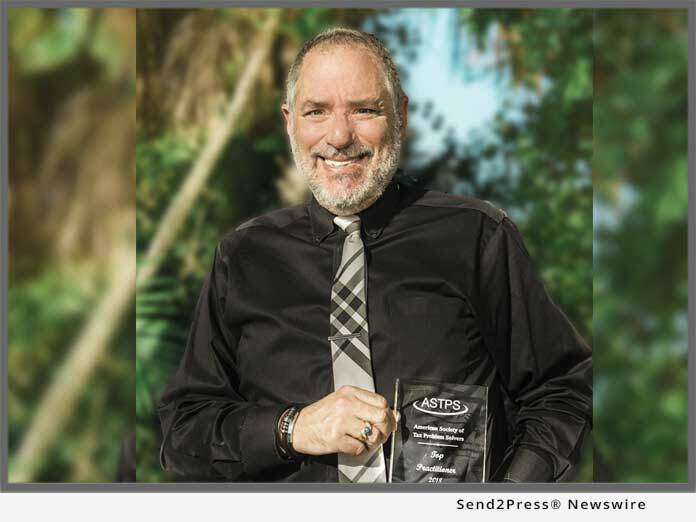 STUART, Fla., Nov 08, 2018 (SEND2PRESS NEWSWIRE) -- Stuart Enrolled Agent and Certified Tax Resolution Specialist, Jeffrey Schneider of SFS Tax Problem Solutions was chosen by the American Society of Tax Problem Solvers (ASTPS) as the 2018 Top Practitioner. ASTPS presents the award to members who consistently work in tax problem resolution demonstrating a dedication to ASTPS principles. Top practitioners work to enhance the industry's image and maintain their skills through continuing professional education. They exhibit a willingness to assist both colleagues and taxpayers. Top practitioners demonstrate intellectual curiosity and creativity in solving IRS problems. They inspire and motivate by action and example. They show professional and ethical integrity, passionate client advocacy, and dedication to doing what is right. Schneider, a certified tax resolution specialist, is celebrating his 40th year in the tax field and has been practicing in the Stuart area for more than ten years. He offers tax problem tips on his website at sfstaxproblemsolutions.com, as well as a white paper on the "7 Secrets the IRS Doesn't Want You to Know." An enrolled agent (EA) is a federally-authorized tax practitioner who has technical expertise in the field of taxation and who is empowered by the U.S. Department of the Treasury to represent taxpayers before all administrative levels-examination, collection, and appeals-of the Internal Revenue Service. For more information about Jeffrey Schneider, visit: http://sfstaxproblemsolutions.com/ or https://sfstaxacct.com/.